A range of wildlife and environmental problems have been created in the Great Lakes area due to many years of uncontrolled industrial waste dumping. It is proposed that snapping and painted turtles in Lake Michigan could be a practical way for determining the resultant pollution. Gary Lamberti, professor of biological sciences and director of the Stream and Wetland Ecology Laboratory at the University of Notre Dame, and his colleagues were working on a federal Great Lakes Restoration Initiative project to evaluate, improve, and restore Great Lakes coastal wetlands, when Dayna Smith, an undergraduate scientist, suggested that turtles that were caught in fish nets could be checked for contaminants. Sponsored by the U.S. Environmental Protection Agency, the project involves a large association of agencies and universities in the Great Lakes area, together with Notre Dame, partnering in a 10-year monitoring program. The program involves the examination of water quality, plants, fish, birds, invertebrates and amphibians, but does not involve any reptiles. 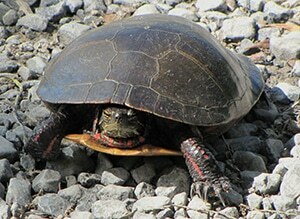 Smith, Lamberti, Matthew Cooper, a graduate student, and Jessica Kosiara, a research technician, discovered that painted turtles and snapping turtles, which have a lifespan of 2 decades and 5 decades, respectively and are gathered for food, were the general inhabitants of the wetlands. The researchers examined the liver, muscle, claws, and shell of the collected turtles in four wetland locations for cadmium, copper, iron, chromium, magnesium, lead, zinc, and manganese. The scientists found that all the turtles carried all the eight metals, and that concentrations mostly correlated with examinations of metals in the wetland soils. They also discovered that analysis on little samples of claw and shell gave rise to results akin to those found in liver and muscle, indicating that the analysis could be carried out without actually killing the turtles. The turtles can be a useful means for estimating wetland pollution since they have a longer lifespan than fish and are comparatively high on the food chain. Apart from being indicators of pollutants, snapping turtles that are eaten by humans might pose a health risk to those people comparable to the health advisories placed on huge Great Lakes fish. A paper explaining the study performed in collaboration with Notre Dame’s Environmental Change Initiative (ECI) has been reported in the Environmental Monitoring and Assessment journal.